Improve the efficiency of your home or office with audio/video installation from All About Sound & Video. Our expert services cover everything from security to temperature control. 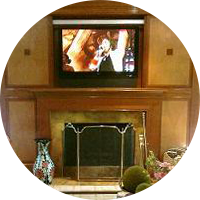 Learn more about our home entertainment installation services from the images on our gallery page. Then call us today to schedule a free consultation for your home or office. Increase the appeal of your home with a home entertainment system from All About Sound & Video in Potomac, Maryland. Our team has two decades of experience integrating all of the systems in your home, such as audio, video, security, lighting, and temperature control, into a single, cohesive unit. It allows you to control distributed audio and video, home theaters, flat-screen displays, and phone and data networks via touch screens or handheld remotes. You can also control everything from outside your home with your iPhone® or iPad. Our solutions are scaled to the size of your project and space, whether it's an 800-square-foot apartment or a 25,000-square-foot home. We started out doing satellite systems and have expanded to provide automation to both residential and commercial customers. We are members of the Custom Electronic Design & Installation Association.